Tearaway, the new game from Little Big Planet creator Media Molecule, is a game that made me smile. My biggest smile came as Iota, the cutesy lead character in PS Vita game Tearaway that has a head that looks like an envelope (you can also play as a female character called Aoti, if you want), was riding on the back of a pig – that I was controlling – as it ran riot through the game’s brightly coloured world, a world made entirely out of paper and cardboard. At the end of the piggy rampage, the pig spotted a female pig and the pair trotted off to a barn, a giant question mark hanging over Iota’s head. 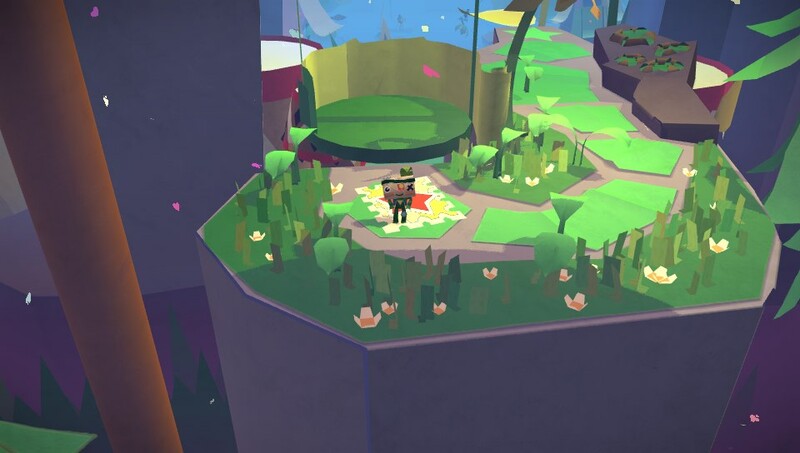 Tearaway is a game that will make you smile till your face hurts. Earlier, I’d had to make the pig cuter for its owner, attaching a false moustache to his piggy lips (do pigs have lips?) I took all the photos in this write-up using my Vita’s image capture function but in hindsight, I wish I’d taken a screenshot of the pig. 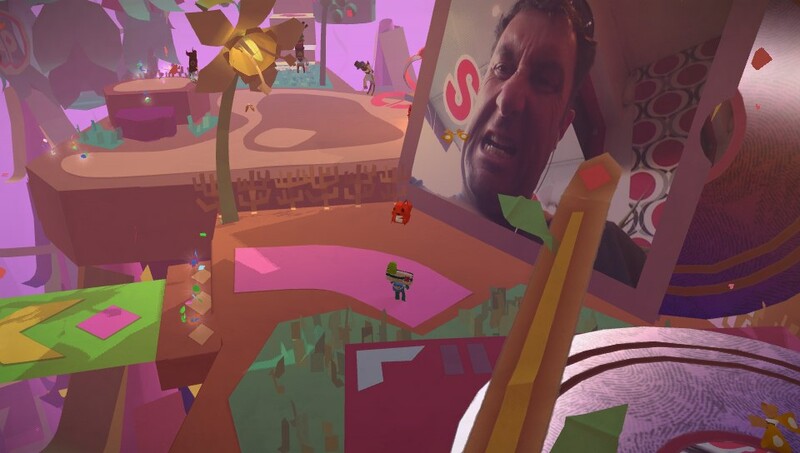 Tearaway is a game where your face – yes, the face of the player – plays a starring role, captured by the Vita’s front-facing camera and pasted on the game world’s sun (there’s a photo here where you can see my ugly mug staring out), elevating you to the lofty heights of a god that the world’s inhabitants revere. You’re referred through out the game as “You”. It’s a game where you use your fingers (and the rear touch pad) to punch through things to move obstacles, pull open ribbons on presents and beat drum skin-laden bounce pads that propel the game’s star, Iota to higher levels. It’s a game where you’ll use your fingertips to open presents and trap doors. 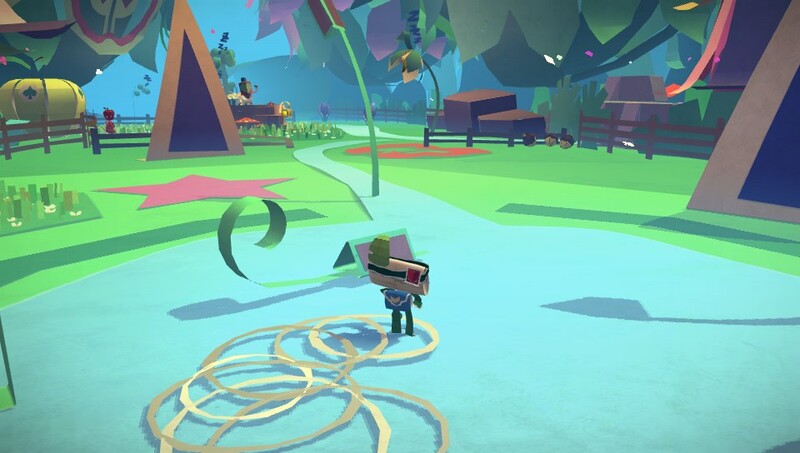 Tearaway is a delight of a game that takes the magic developer Media Molecule crafted into Little Big Planet and plasters it liberally in a world with dancing apple cores made out of paper open and close when you approach, squirrels throw acorns at each other and paper plants unfurl their leaves when you walk through them. It’s magical. Iota is a messenger sent to safe the world from an unknown evil and as Iota explores, the world comes to live. When he stands on a bounce pad (it looks like a drum skill), tapping on the Vita’s rear touch pad, propels him into the air, landing on platforms above. Bridges made out of green paper unfurl as he approaches them, carnival music blaring in the background. Paper plants pop up as he walks by, and concentric circles radiate from his feet as he walks through a stream, made out of paper. It’s a platformer at heart, with Iota/Aoti jumping and rolling about the game world but the fact that you have to use your fingers to manipulate the game world for your character to progress is just genius. There’s combat, but it’s basic, basic stuff where you roll into enemies (Iota/Aoti can turn into an orb) called scraps, knocking them senseless, then pick them up and toss them. I could wax lyrical about Tearaway for much, much longer but I won’t. I’ll stop here but it’s been one of the most enjoyable handheld gaming experiences I’ve had in a long, long time. It’s games like Tearaway that make it worth owning a PS Vita, a fantastic handheld console – with an amazing screen – that has been neglected for too long by Sony, but it seems that with this year’s Killzone Mercenary and now Tearaway, Sony are actually giving the love back to its handheld. 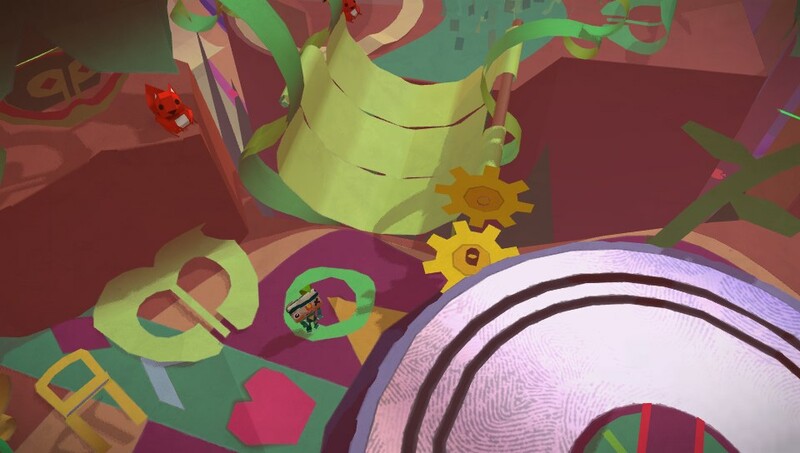 Tearaway creates the same kind of magic that LittleBigPlanet did and for my money, Media Molecule have another hit on its hand. Right, enough waffling: I’m off to guide Iota on his next quest. I wonder what wonders will unfold before my eyes? Tearaway is out on PS Vita on November 22. Sorry about this: Oh, look it’s my ugly mug staring back at me (and now, staring back at you).